Here is a quick peek of a small corner of my vanity where I display my perfumes. 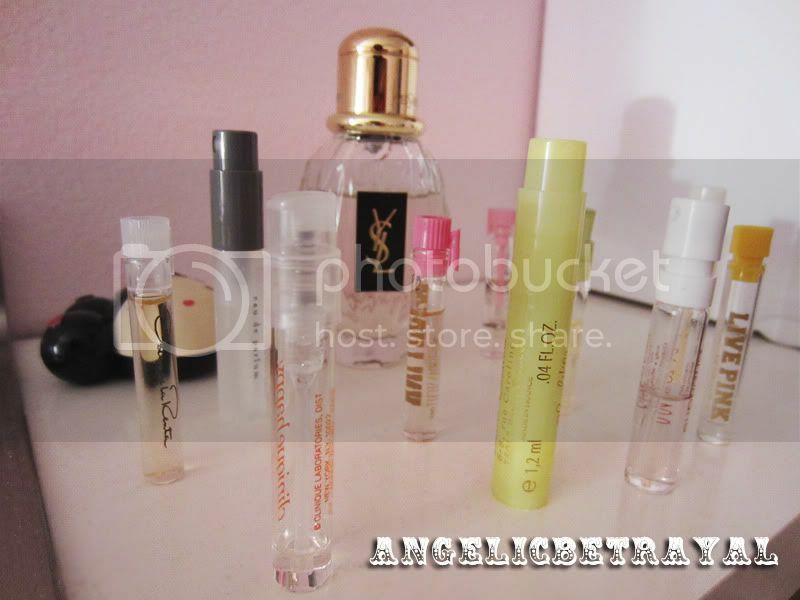 As you can see I only have one full sized perfume, YSL's Parisienne, which I loved as a sample. I was never a big fan of fragrances so I hoarded up all the little samples I collected from various Sephora orders and promptly forgot to use them. I thought it was about time to start using them up so onto the vanity they go! It actually takes me at least ten uses to finish up a sample which I think is a decent amount of time!Most of the time, perfumes are a complete miss for me. But I have found a few loves along the way, most notably Dior's Jadore (I will buy the full size after I finish off a couple of more of these samples to clear up some table room). I also quite enjoy Clinique's Happy which is almost done as you can see above. I firmly believe in the phrase "out of sight, out of mind" so I have to be able to see products if I plan on using them up! So far, so good. How do you display your perfumes? How many perfumes do you have in your collection? Do you remember to use your perfume samples? i have ysl parisenne in full too. LOVE it! !